Girl Scout Lauren James is pictured with members of the active military. Lauren is the daughter of Attorneys Robert, II and Angela James, and the granddaughter of Robert and Shirley James of Savannah. Lauren would like to thank her many friends, including those in the Savannah area, who supported the Smiles 4 Military Sendoff Program and her sales of Girl Scout Cookies. 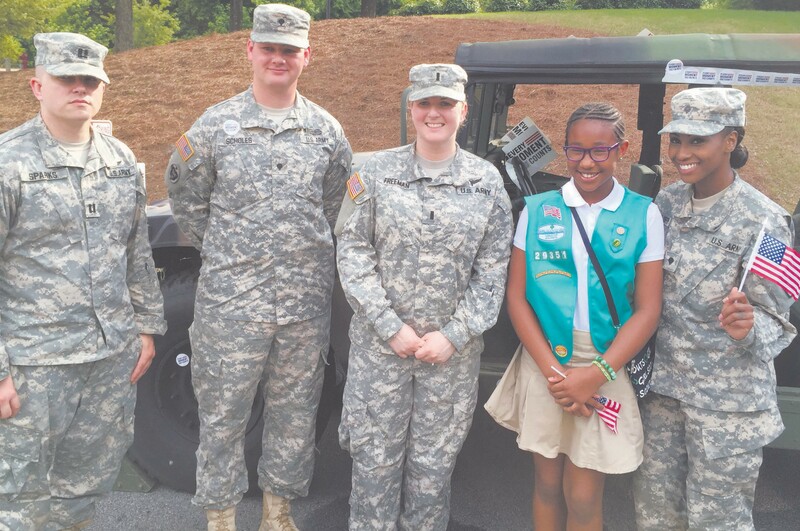 On May 17, the Girl Scouts of Greater Atlanta honored America’s military and the Girl Scouts who support them during their annual Smiles 4 Military Cookie Sendoff Program. The program, held at Girl Scouts headquarters in Mableton, Ga, drew over a hundred Girl Scouts, active military, families and veterans. The ceremony marked the end of the annual Girl Scout cookie drive and the Smiles 4 Military component. Smiles 4 Military allows Girl Scouts to support the troops during cookie sales by collecting donations that go toward boxes of cookies that are shipped to active US military members deployed at home and across the globe. In 2015, Girl Scouts of Greater Atlanta collectively sold over 144,000 boxes of cookies that will go to soldiers, sailors and airmen around the world. The Cookie Sendoff event featured an address from U.S. Army Major Schwartz, who recounted a personal experience with Girl Scout Cookies while on a forward deployment in Iraq. According to Major Schwartz, his unit was made responsible for entertaining a meeting with an important local Iraqi community leader at the last minute, and his unit had little to offer in the way of refreshments. Luckily, the unit had recently received their annual shipment of cookies, which were hastily arranged on a tray and offered to the local leader together with coffee. After a productive meeting, the Iraqi leader sent word back to Major Schwartz that he desired the name of the local bakery that had produced such delightful pastries. The Girl Scouts also recognized the top 20 Girl Scouts in Metro Atlanta in terms of sales for Smiles 4 Military. Assisted by her sales in Savannah, Lauren James, a 4th grader at The Children’s School in Atlanta and a member of Troop 29351 ranked sixth overall with 327 Smiles 4 Military boxes sold. Taryn Claassens of Troop 13314 was first overall with an incredible 2,252 Smiles 4 Military boxes sold. The other members of the Girl Scouts listed in the top six were: Caroline Hill of Troop 4047 – 680 boxes sold; Grace Malko of Troop 12492 – 399; Elle Morrison of Troop 4047 – 368; and Morgan Jones of Troop 7823 – 363 boxes. All of the top 20 honorees received certificates from Girl Scouts of Greater Atlanta CEO Amy Dosik and COO Vikki Millender-Morrow. In addition, all of the Girl Scouts in attendance had the opportunity to sit in an Army Humvee and meet, interact and pose for pictures with active military members who were present for the event.